Today Chaos Castle is delighted to welcome Jenna Harrington, author of Katie McGinty Wants a Pet, into the courtyard. Hello, Jenna, thank-you so much for coming to Chaos Castle, it’s lovely to chat again. 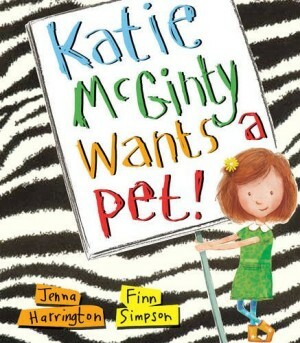 Katie McGinty is your first picture book, had you been writing for long before it was accepted? Katie McGinty Wants a Pet is the first picture book I’ve ever written. I had the initial idea back in 2004 when I was working as a mother’s help during my summers at Uni. I wrote down a very basic outline and then put it to one side for a long time. It was in 2011 when I was doing my MA in Creative Writing that I thought I’d have a go of turning my notes into a proper text, though I didn’t really know how to lay it out at all. It didn’t take too long to write the text, but I was too nervous to show anyone. Again I sat on it for a while and it wasn’t until two years later that I showed it to Little Tiger Press and they agreed to publish it. That’s a fabulous break, we’re so glad you didn’t hide it forever! Last time we met, you mentioned that the story was inspired by a child wanting a zebra as a pet. Were the characters inspired by people you know? Katie certainly was. She was based on the eldest child of the family I worked with as a mother’s help. She was three years old when I first met her in 2004 and she was obsessed with animals. She used to say, “When I grow up, I’m going to have two dogs, a cat and a zebra.” This seemed completely plausible to her back then, though now, at nearly 15, she can’t believe that she ever said that. Her name is Katie. Small children are great inspirations and it’s lovely that you’re still in touch with her. I hope she loves the book too. Illustrations are very important to us at Chaos Castle, are the illustrations for this story how you imagined them to be? The illustrations are just as I imagined them, well better really. I could imagine the scenes in my head when I was writing the text and as I didn’t know how to present it, I wrote notes on what I thought each illustration should show. Finn’s work is perfect. I love how the book looks. The process is very separate and I didn’t work with Finn directly, but Little Tiger Press sent his illustrations when they came in. I was so happy when I saw each one. We can understand that, the illustrations are gorgeous! As Katie McGinty Wants a Pet is about a different sort of pet, we wondered if you could have any pet at all, what would you choose? When I was a child I always wanted a dolphin, not exactly your standard pet – I would have liked Katie’s way of thinking. Now I think I’d quite like a wolf, but I think I’ve been influenced by reading and watching too much fantasy. I’m not sure the Chaos Castle forest wolves are quite pet material, but if we do find one that wants to be a pet we’ll let you know! Finally, as we do love hearing about new books at the Castle, do you have any other books in the works? At the moment I’m working on a few different projects. I’m writing a YA book, as well as playing with a couple of picture book ideas. I was fortunate with Katie McGinty Wants a Pet that I found her voice and charm quite quickly. With the texts I’m working on at the moment, I’m still looking for that hook, or the perfect ending. That all sounds very exciting, and best of luck with finding those endings. Posie (6) would like to request more Katie McGinty if you get more ideas! Thank-you for popping into our courtyard, Jenna, and we hope to see you again soon.